Artemius of Antioch (+ 362), commander of troops under Constantine and his son. Due to his outstanding service, he was appointed Viceroy of Egypt. The emperor Constantius was succeeded on the throne by Julian the Apostate (361-363). Julian attempted to rid the empire of Christians through a pogrom. Artemius came to Antioch and denounced Julian. He was arrested, tortured, and imprisoned. Artemius refused to pay homage to the Roman deities, and for this he suffered more torture and was eventually beheaded. 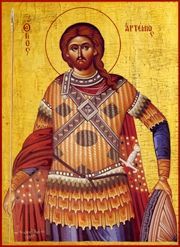 His relics were transferred from Antioch to Constantinople.